Join us for the largest gathering of Maryland youth development professionals convened by MOST Network and Maryland MENTOR. 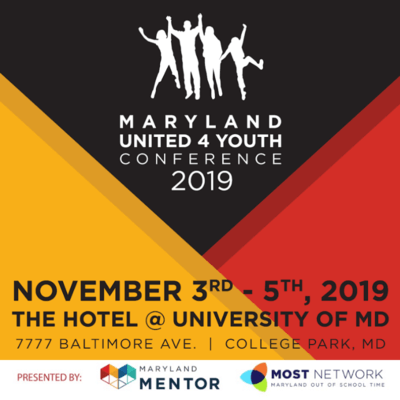 The 2019 Maryland United for Youth Conference is designed to support changemakers to feel unified, supported and inspired. The work of changing the status quo is challenging, making it essential to prioritize connection and personal wellbeing in the process. In order for the sector to survive and thrive, youth serving organizations and those who support them, must do more to minimize burnout and overworking, and promote collaboration and self-care. It is crucial to the health of our sector and its ability to drive change. This conference will provide opportunities for resource-sharing, capacity building, connection, reflection and mindfulness to strengthen partnerships to increase our collective impact on the lives of young people in Maryland. Early-bird registration is open now through April 6, 2019. Get your tickets to this one of a kind conference for only $295. Group rates are also available. Save 10% when you buy 5 or more conference tickets. Save your spot for our unique ‘Health is Wealth’ pre-conference event with programming focused on stregthening the physical and mental wellbeing of practitioners and the organizational capacity of the organizations they serve. Conference Video Production RFP now available! The Maryland United for Youth Conference is seeking a vendor to provide video and photo production services for the inaugural Maryland United 4 Youth Conference 2019. Please submit all questions and the completed RFP by 5:30 p.m. on Friday, April 5, 2019. Documents can be mailed to the MOST office at 1500 Union Ave., Baltimore, MD, 21211 or emailed to Sadiq at sali@marylandmentor.net. View the full RFP here. Network with 500 other youth development practitioners to share resources and gain insights you can take back to your organization to improve your programming and increase your impact. Get inspired by our expert presenters and find innovative new services at the booths of our 30+ curated exhibitors. 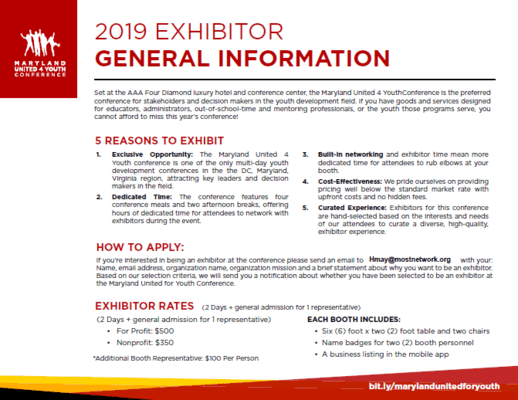 Health and wellness activities are planned throughout, so you will leave the conference more knowledgeable, rejuvinated, and ready to work for Maryland’s youth! There’s no better place to celebrate and empower the youth development field in Maryland than College Park. 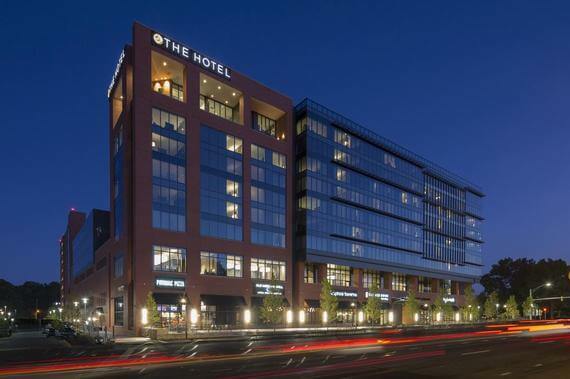 Indulge yourself with a visit to the most exciting, AAA Four Diamond luxury hotel and conference center in the entire suburban Washington DC metro region. The Hotel at the University of Maryland offers business and leisure visitors elegant accommodations, an array of dining choices with five restaurants, and world class service and amenities. Located directly across the street from the main entrance to the University of Maryland campus, we are convenient to Washington DC, Maryland and Virginia and all they have to offer. Click here to reserve your room at our special, discounted rate. 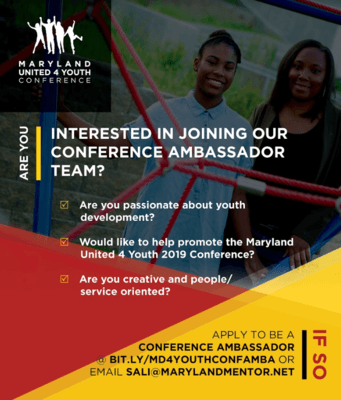 The Maryland United for Youth Conference Team is looking for 5-10 Maryland-based youth development leaders and influences to utilize social media and live streaming to promote the Conference and the work of our programming partners. Preferred candidates will be active on social media, familiar with social media practices, and have a passion for youth development and collaboration. If this opportunity sounds like a good fit for you, please email Sadiq at sali@marylandmentor.net. Interested in showing off your services, curriculum, and products to our 500 youth development practitioners and experts? Fill out our Exhibitor Application Form. For questions, please email Heather at hmay@mostnetwork.org. 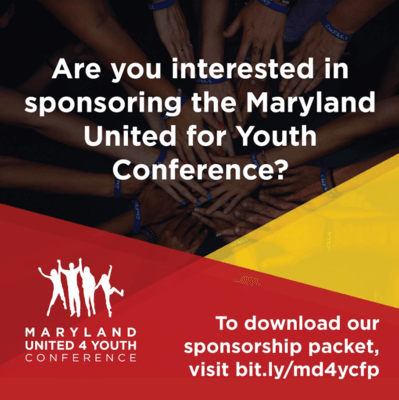 Show your support for Maryland youth through a conference sponsorship. 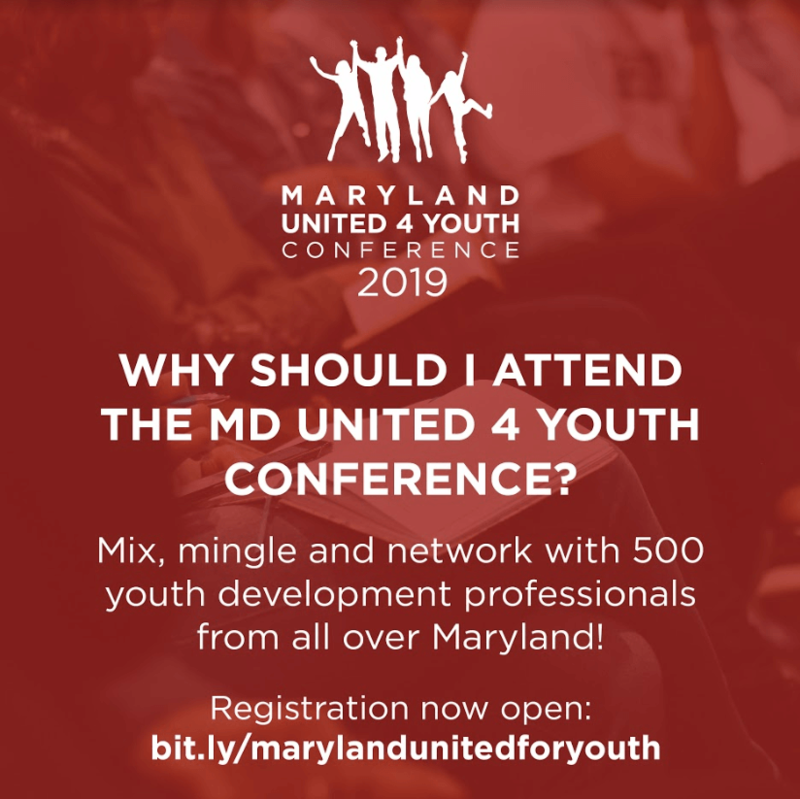 To view a full listing of available opportunitites, click here or visit the Maryland United for Youth conference page. For questions or to find out more, please email Andrew at aneuman@mostnetwork.org.